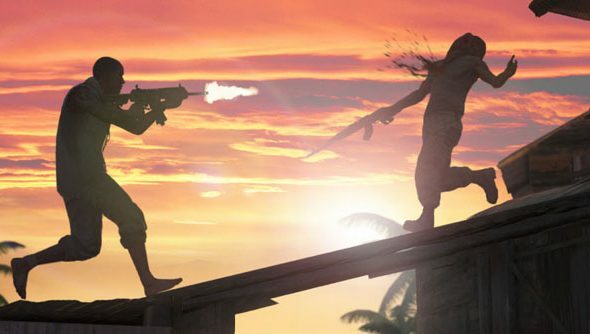 The latest video of Far Cry 3 shows off how its tribal tattoo system works, providing unlockable powers that change the way you play, enhancing different playstlyes. It shows how the three tats you can change your fighting style from long range, to stealthy, to up close and fighty. Check it out. Apologies: The original post had an ill-thought out and needless insult directed at people who havetattoos – you can see the evidence of it up in the URL. I apologise for that it was off the cuff and rude, I’ve edited out any inappropriate remarks. It’s difficult to make out from the video how the tattoos change your play-style except for different stabbing animations. They say in the video that “Your character has three unique abilities, represented by three different tattoos […] the Hare will make you an expert in rapid fire weapons, attacks from the sky, or attacks from under water. The Spider’s stealth will make you an expertguerrillatactics and ambushes. Stealth and silent knife attacks will become second nature […] the Shark’sabilitiesare based on pure strength but brute force will allow you to surprise your enemies with this unique ability” – but, as I said, this seemstakes the form of different sorts of stabbing. Far Cry’s being released on 30 November and I couldn’t be more excited (that’s hyperbole, I am excited to get my hands on Far Cary 3 but let’s not go overboard here, I’d get more excited at the prospect of the arrival of a Winnie the Pooh sippy cup that let me drink tea in the shower. That’s not to belittle Far Cry 3 but, rather, to get across quite how much the prospect of drinking tea in the shower excites me).